Every year, over three million cases of carpal tunnel syndrome (CTS) are reported in the United States (Mayo Clinic). 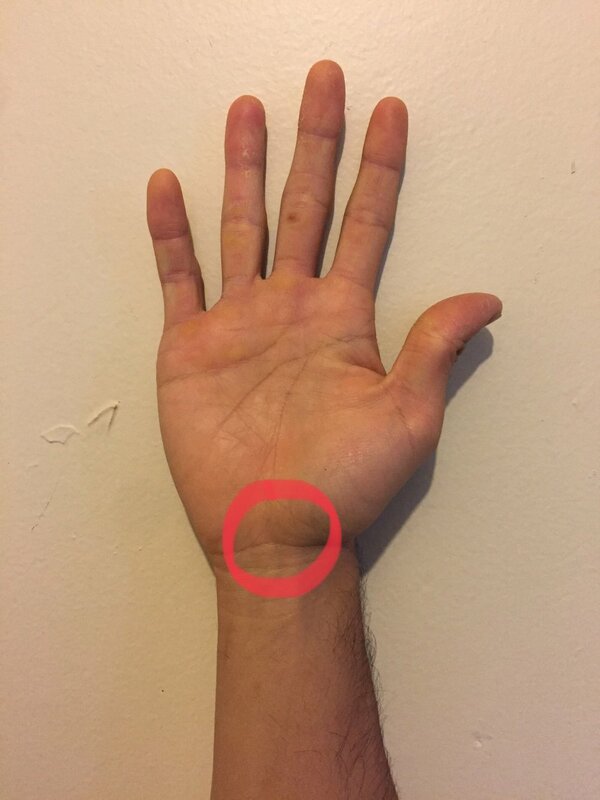 True CTS results from irritation or inflammation of the median nerve as it passes through the tunnel in your wrist. This tunnel is a narrow passageway of ligaments and bones at the base of your hand. Pressure can build up in this tunnel, resulting in numbness or tingling in the hand. Continued strain can lead to severe pain in your wrist, making work and daily activities uncomfortable to accomplish. However, symptoms such as numbness, tingling, and wrist pain are oftentimes resulting from musculoskeletal dysfunction (meaning: tight muscles), and not true CTS. Sometimes, thickening from the lining of irritated tendons or other swelling narrows the tunnel and causes the median nerve to be compressed. The result may be numbness, weakness, or sometimes pain in the hand and wrist, or occasionally in the forearm and arm. CTS is the most common and widely known of the entrapment neuropathies, in which one of the body’s peripheral nerves is pressed upon. Many cases of Carpal Tunnel Syndrome are misdiagnosed for several reasons. We don’t truly understand the causes of Carpal Tunnel. It seems to be aggravated by overuse and strong evidence that by correcting daily movement you can make significant improvement. While the Median Nerve is implicated in CTS, it actually begins from the spinal cord and rooting through your neck and out almost every vertebrae before running down towards your fingers. Given that the Median Nerve crosses many muscles on the way to your fingers. It’s no wonder that any number of factors might cause CTS-like symptoms like a tight muscle in your neck or shoulder may cause “tingling” in the fingers. And while it’s similar it isn’t necessarily CTS. It goes misdiagnosed because most doctors aren’t necessarily well versed in understanding soft tissue related dysfunction. This leads to a general diagnosis of “tendonitis” which often will call for you to rest. Do seek a second and third opinion if the doctor wants to inject you or schedule you for surgery. Fortunately, carpal tunnel-like symptoms can often be easily managed with soft tissue work performed on the scalenes, pec minor, coracobrachialis, and several other upper extremity adhesion sites at the cervical spine. Two very common suggestions to relieve CTS are cortisone injections in your wrist, or surgery to cut the transverse carpal ligament to release pressure. While it may seem like a quick fix, I am strongly against cortisone injections as they have been shown to speed up degeneration of damaged ligaments and cartilage. You can perform this seated or standing. Passively let your wrist flop into a flexed position as shown in the diagram above. Hold this position for 60 seconds or until symptoms are reproduced. Positive response: numbness and tingling occurs on the palmar aspect. Negative response: 3 minutes passing without symptoms reproduced. Lightly tap over the median nerve as it passes through the carpal tunnel in the wrist. Follow your index finger from the tip, then down the palm and up the forearm looking for any sensation. Positive response: A sensation of tingling in the distribution of the median nerve over the hand or in the thumb or first 3 digits. If either test returns positive, I recommend seeing a doctor. If both tests return negative, great! You most likely do not have CTS and can relieve symptoms without surgery. Focus on sitting up straight, shoulders neutral, and keep the chin in and head straight. By making sure you're sitting and standing upright, it will take the tension of the muscles that might be causing your CTS-like symptoms in the first place. Keep your wrists in a neutral position, not bent backwards. This can help prevent a lot of the tightening of the muscles which can possibly entrap a nerve. Reaching your right hand down at your side towards the floor, let your head tip to the left. Slightly vary the angle of your head to feel different versions of the stretch. Hold this to each side for 15-30 seconds and repeat 2-3 times per side. Standing up straight with a tightened belly, reach your arms straight out to your sides at shoulder height (as seen above). Move your arms straight back as far as they’ll go without arching your back. 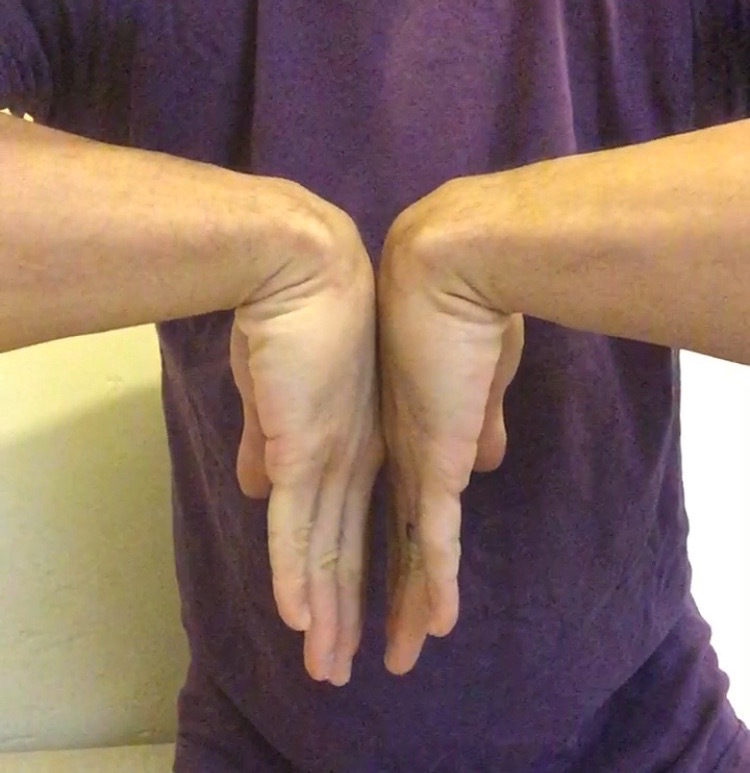 You can do this with assistance from a doorway or wall to help your hands move back. Hold for 10-30 seconds, without pain. Repeat 2-3 times. 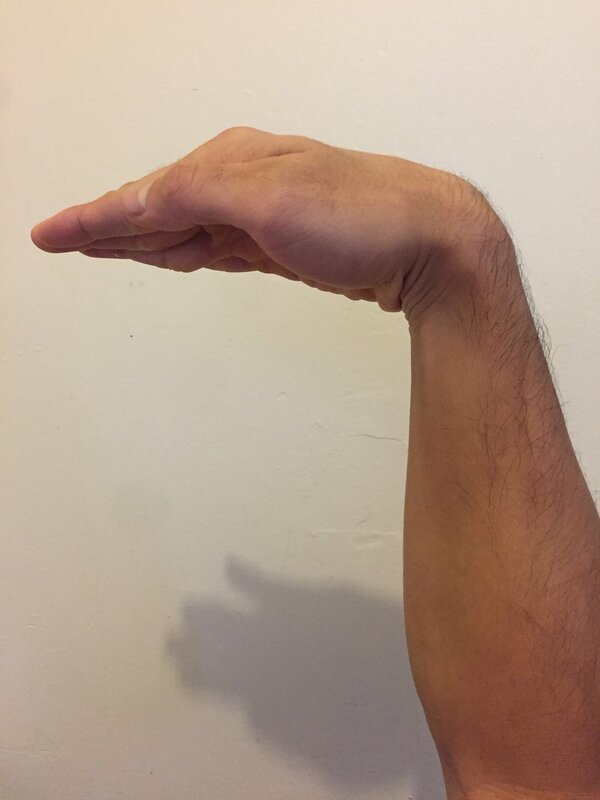 With your right arm held out in front of you, use your left hand to stretch the wrist stretching the hand up (shown above). Hold each for 15-30 seconds, 2-3 times. Repeat on other side. In conjunction with the improving your posture, wrist position, and stretching, manual therapy from a Licensed Massage Therapist can greatly relieve CTS-like pain. After finding and relaxing the contracted muscles in the above mentioned areas, corrective exercises are performed to offset any problems associated with poor posture and poor breathing patterns. Has a doctor suggested wearing a wrist brace for extended periods of time (all day and all night, even when you're sleeping)? Restricting wrist movement isn't a solution and doesn't address the true underlying problem. If this sounds like you and the tests above show you don't have true carpal tunnel syndrome, schedule a consultation in person or online and get rid of your tingling, numbing, debilitating wrist pain for good.